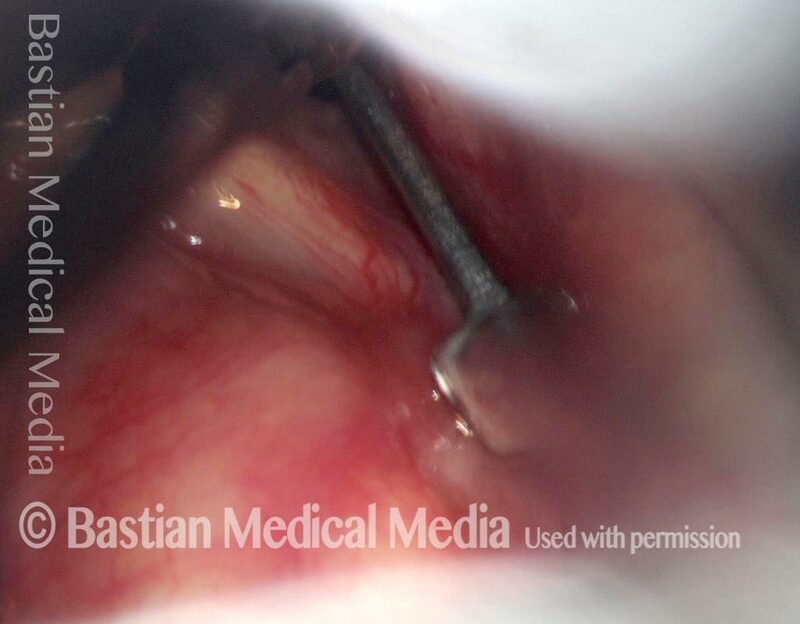 Post-intubation synechia tethers the arytenoid cartilages together. This patient is tracheotomy-dependent. 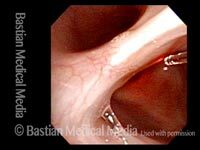 Operative view of synechia ("v" of the vocal cords is inverted). 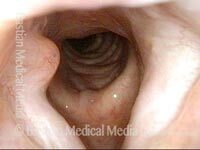 Notice that the vocal cords are completely approximated because the synechia has bound them together. 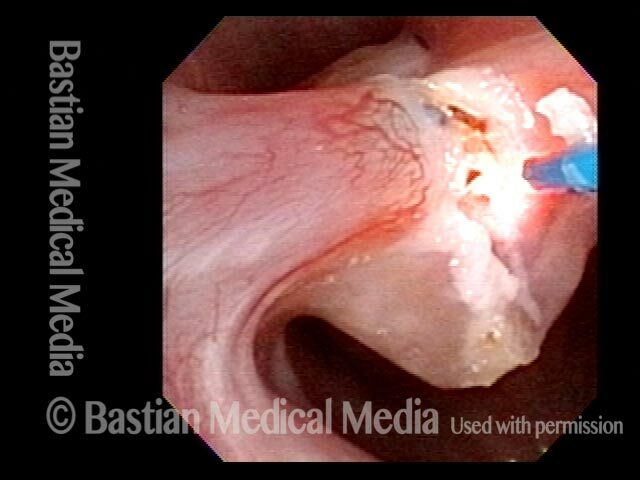 Tiny forceps is separating the cords (arrows) and more clearly shows the extent of the synechia. Micro-scissors in position to divide the synechia cleanly. For perspective, the blade of the scissors is only a few millimeters long. After division of the synechia and topical application of an anti-scarring agent. Five days after surgery. Vocal cords are able to separate for breathing, and the tracheotomy tube can be removed. Compare with photo 1. 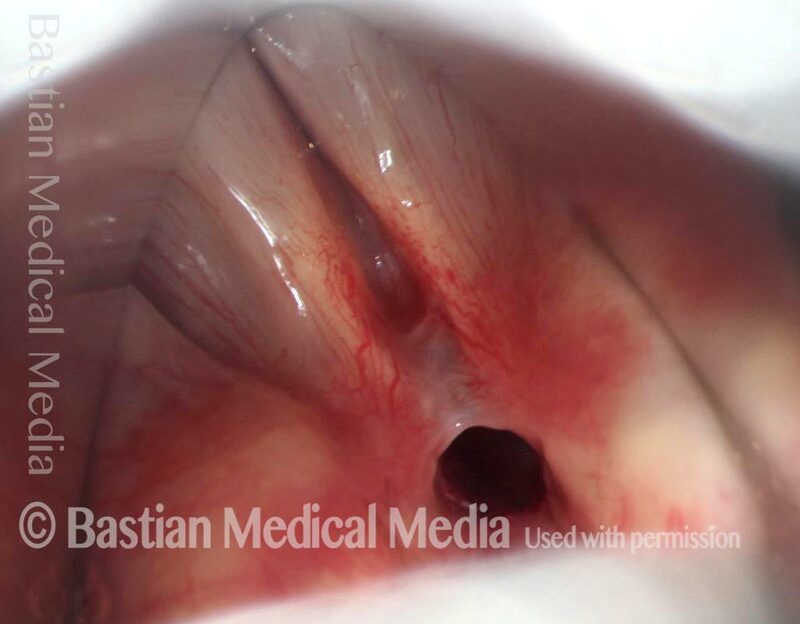 Completely healed larynx after release of synechia. Abduction completely restored. 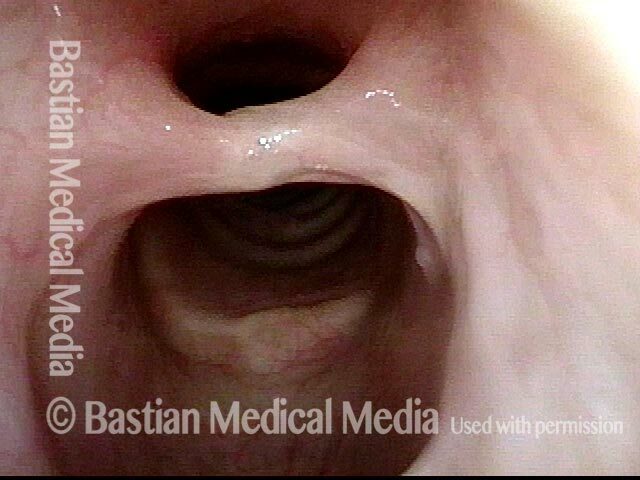 As the vocal cords are coming together for phonation (not yet completely adducted). Closer view. Can hardly see where the synechia was. Compare again with photo 1. 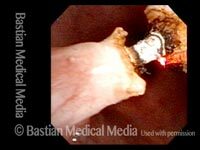 Six months after the initial laser treatment for this patient's bone-containing synechia. The synechia is now gone, with only a small residual projection remaining, left of photo. 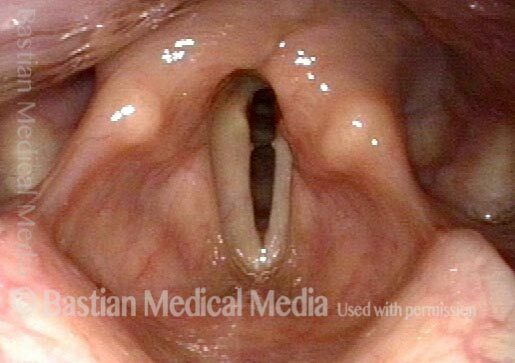 The vocal cords also separate more widely, to a wider "V". During phonation. 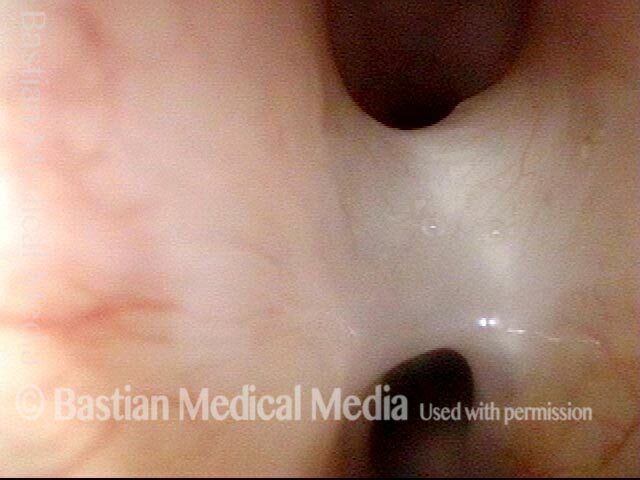 The divots from pressure necrosis of the endotracheal tube remain evident. In spite of them, the patient's voice is excellent. This 75-year-old woman suffered complications after open heart surgery, and was intubated for three weeks. Nearly two years later, she remains short of breath and bothered by difficulty mobilizing secretions. 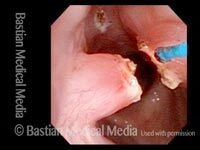 On initial examination, a synechia was identified; at patient request, microlaryngoscopy was scheduled both to divide the synechia and to inject voice gel into the deficient posterior commissure. At surgery, a view sufficient to divide the synechia was not possible. The patient was rescheduled for office-based thulium laser division of the synechia. Close-range view of the synechia. The tip of the glass fiber through which laser energy will be delivered is seen just inferior to the synechia. As the synechia is divided, a core of bone formation is exposed. More than half of the laser energy has been delivered to this spar of bone, yet it will not yield. The tip of the scope has also been flexed against the synechia to no avail. A second attempt with higher energy laser has been scheduled. Four months later. 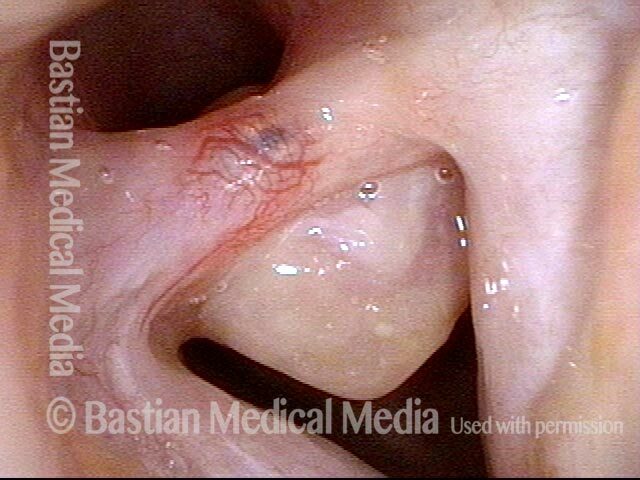 The synechia remains, and there is residual granulation tissue on its undersurface. It's not yet known whether the spar of bone is still present. Compare with photo 2. Now, with the thulium laser, beginning a second attempt at dividing the synechia. The spar of bone is not found within the synechia (apparently turned to ash during the original procedure four months earlier), and now the scar band is divided. The patient could feel the difference in her breathing immediately. Note that the vocal cords cannot fully abduct, due to the presence of a synechia, which tethers them to each other posteriorly. Same patient at closer range. Same patient. Synechia in full view. 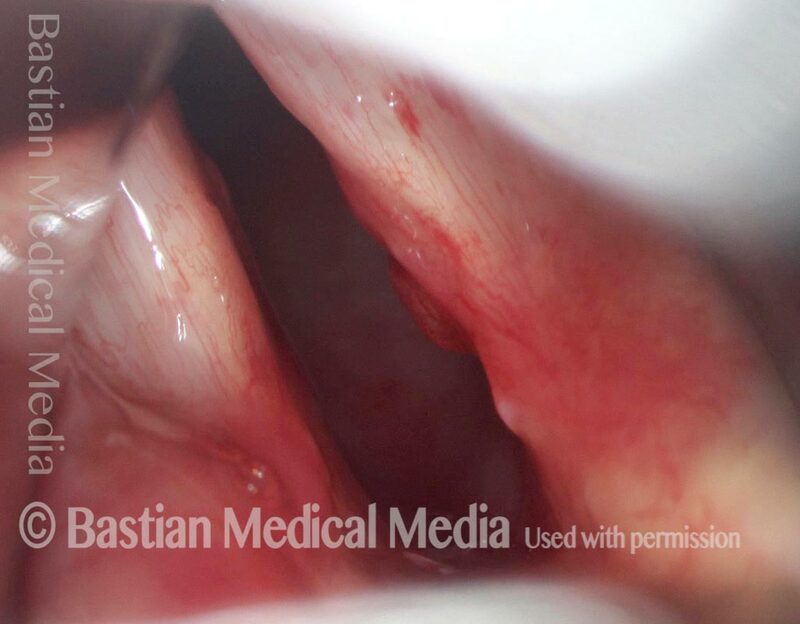 Maximum possible abduction of the vocal cords, as seen a few months after an illness that required endotracheal intubation for 3 weeks. 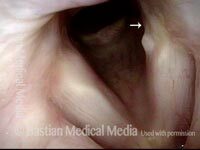 This person experienced noisy breathing with any significant exertion. With elicited sudden inhalation the inspiratory air draws the vocal cords together, and the result is involuntary inspiratory phonation. 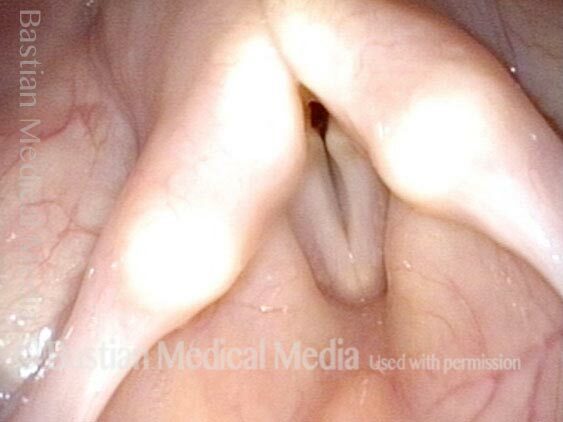 Close-up view of the posterior vocal cords reveal a synechia or scar band tethering the vocal cords to each other and preventing their abduction. This kind of injury can exist in isolation; it can also occur together with cricoarytenoid joint ankylosis. An even closer view of the synechia.